I took this picture of some fall flowers the other day. What strikes me is how the beauty of the colours contrasts with the dark of the shadows. As these days get shorter and the darkness of the winter season settles in, I am feeling the shadows. While there are the bright moments of times with friends, hard-fought progress at work and time at the torch or behind the camera, there are the still quiet moments of sadness and alone-ness. I wish I didn’t have to live with the shadows. To feel what lies there. It would be nice to numb out the feelings – with food, with TV, with busy-ness, with whatever. But, then I don’t get to feel the light, the sunshine and the colour. And, I don’t want to be numb to that. So, as I head into the darkness of winter, I am going to try to remember to be in the light but also just to let the shadows be. To accept the sadness so that I can also accept the joy. And to be thankful that I am alive in the feeling. 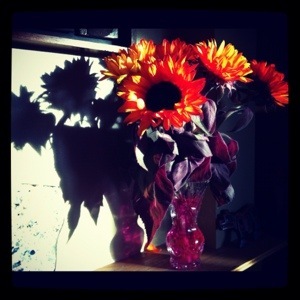 This entry was posted in depression, gratitude, recovery and tagged shadows by WendyA. Bookmark the permalink.